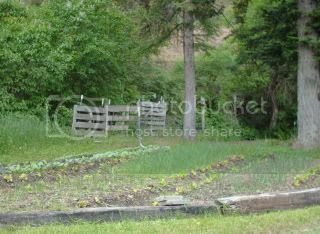 I really want to build a raised bed for greens and herbs next to our shed. The only problem is the way the sun rises and falls, after about 1 pm (ish) they won't get anymore sun. Is this ok for lettuce, spinach, and herb plants? Or not for some?? If you can find the info - and it isn't easy for every type of veggie or herb, see what the recommended Daily Light Integral for each variety is. Simply put, it is the amount of light in the spectrum plants use received over a 24-hour period. Sun-loving plants need about 20 mols/day. As a reference, that is about four hours of bright sunlight in summer. There was quite a few onions in the beds that season. Lettuce is on the outside of the beds and that is bok choy with the lighter, shiny leaves, I believe. Spinach will also do well in this location. I grew a lot of parsley in one corner in 2010. There is only direct sun until about 10:30, near the trees. Then, the shade begins to move across this garden and it is entirely in the shade by about 1pm. There are 5 trees within 50 feet to the west and southwest of this ground. In my yard, mint only has a few hours of sun and my chive patch, has less sunlight than almost anywhere. The mint and chives do just fine year after year and the parsley did well last year in its location. Last edited by digitS' on Thu Jan 13, 2011 11:04 pm, edited 1 time in total. Broadleaf herbs, such as mint and parsley would do fine in your location. Narrow-leaved herbs, such as rosemary, need full sun to do well. Thick, narrow leaves just aren't as efficient at producing food for a plant as are broader leaves. Greens like lettuce should do fine, but plants with darker green leaves might do okay, too, but would probably do better with at least 6 hours of sun. Plants that produce fruit, such as tomatoes, really need a minimum of 6 hours of sunlight daily. I think you should experiment a little and try different greens and herbs in your raised bed. You may find that you're quite quite satisfied with the performance of a particular type of plant, even if the results aren't "textbook perfect". Last edited by Kisal on Fri Jan 14, 2011 12:33 am, edited 1 time in total. I too am thinking you will likely be OK since many leafy greens tend to not like too much summer heat and will bolt. If you can eliminate a lot of the late afternoon summer sun and heat, your plants may survive a bit longer. My sweet basil, oregano and rosemary do fine with the sunlight they receive from sun up till about 2:30 each day before my house starts shading that part of the garden. I do live in zone 9 as opposed to your zone 4. Closer you get to the equatorial regions, the sunlight becomes more intense and hot, whereas we have less intense direct sun but longer *daylight* hours closer to the Poles you go. During the growing season, in some areas (PNW and parts of mid-west in particular? ), you get more overcast and/or rainy days while other areas experience a period of extended drought/no clouds. So you need to take those factors into account. Last edited by applestar on Fri Jan 14, 2011 3:26 pm, edited 1 time in total. I think your plants will do fine if they have full morning sun. I think light has what a plant needs wether reflected or direct! I prefer shady areas for lettuce especially after april when lettuce tends to go to seed because o the heat rom the sun. People even make shade for the leaf crops by putting wood or a pellet above the bed from june on! I did that last year with some herbs I put wood slats above bed about a foot. Putting something white or reflective near the bed or even on the ground itseld reflects light to the under parts of the plants. prlite or styrofoam beads worked into helps reflect light. Peppers near a white background will grow better! I even like to plant under a small tree with a shallow root base just watter a little more often! lets get this terrible winter over first! Are you saying that it get's the morning sun? If so, I'd say that you may have just enough to get away with the leafy greens. Like another member mentioned, this may also help you you grow them longer since it will keep them from bolting. Looks like you have gotten advise, tips as I would have done. A note, I have most of my herbs in pots, and have moved them to more or less shade. Also last summer was HOT! And I am in a waaay different climate zone than you! Now, back to suggestions for whatever. Try to separate your perennials from annuals. I know some here don't, but I find it easier to let some P's do their thing (mint, chives) and then have another area for A's. Basil,lettuce comes to mind there. As I say repeatedly, perhaps from my own experience. Trial and Error, and I am great at both!